Prime Minister the Honourable Dr. Timothy Harris meets with Nicholas Rémillard, president and chief executive officer of the International Economic Forum of the Americas (IEFA), the umbrella organisation that convenes the Toronto Global Forum. Toronto, Canada – At the Toronto Global Forum, the prime minister of the Federation of St. Kitts and Nevis, the Honourable Dr. Timothy Harris, gave a noteworthy speech issuing an impassioned plea on behalf of Caribbean small island states. The prime minister, who was invited to speak and share his country’s perspective at the prestigious gathering of political and business leaders, focused his remarks on the vulnerability of the Caribbean region and the need to invest in climate-resilient infrastructure in light of the devastation caused by Category 5 hurricanes Irma and Maria. In his insightful introductory remarks that set the parameters for the ensuing panel discussion, Harris highlighted the need for International Financial Institutions (IFIs) and the Development Assistance Committee (DAC) of the Organisation for Economic Co-operation and Development (OECD) to reconsider the role of GDP per capita measurements in development finance and policy. Harris also echoed Sir Richard Branson’s call for the creation of a “Disaster Recovery Marshall Plan” to help aid in the Caribbean region’s reconstruction and recovery. The panelists, who included high-level representatives of respected international agencies such as the Commonwealth Enterprise and Investment Council and the Inter-American Development Bank, shared the prime minister’s sentiments. Jonathan Laski, director of global projects and partnerships at the World Green Building Council, moderated the panel discussion. 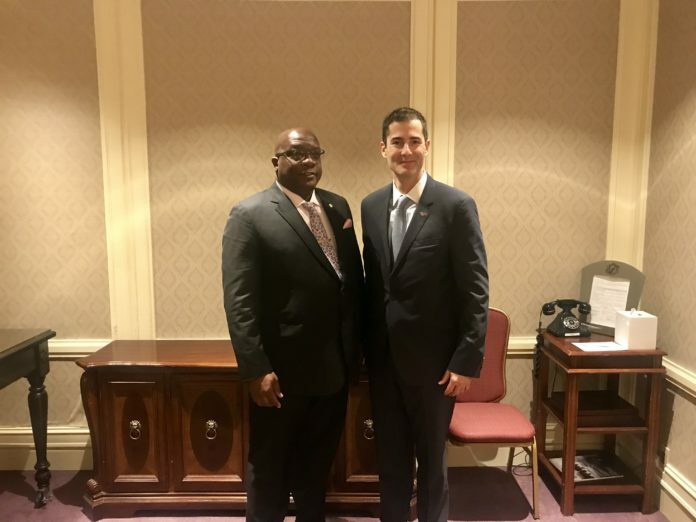 Following Harris’ engaging presentation before the high-powered gathering, he met with Nicholas Rémillard, the president and chief executive officer of the International Economic Forum of the Americas (IEFA), the umbrella organisation that convenes the Toronto Global Forum. Both men discussed a range of issues, including airlift from Canada to St. Kitts and Nevis, tourism and entrepreneurship. They also discussed opportunities for the prime minister to meet with top Canadian investors. Harris used the occasion to invite Rémillard to visit St. Kitts and Nevis to pursue further avenues for partnership.